Former General Manager of the Guyana Rice Development Board, Jagnarine Singh (wearing cap) and former GRDB Director, Madanlall Ramraj make their way to SOCU. 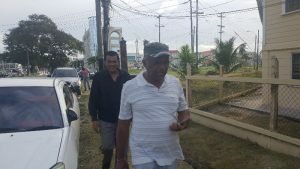 Former Managing Director of the Guyana Rice Development Board (GRDB), Jagnarine Singh and a former director of that agency, Madanlall Ramraj were Thursday charged with allegedly defrauding that entity of more than GYD$8 million. Attorney-at-Law, Glen Hanoman, who is representing Singh, said also facing the joint charge is former GRDB accountant, Peter Ramcharran who is facing extradition proceedings in Canada based on arrest warrant issued by Guyana on a similar charge instituted earlier this year. Hanoman said the Special Organised Crime Unit (SOCU) of the Guyana Police Force has accused the trio of omitting to make an entry into a general ledger and misappropriating the funds between 2010 and 2012. Singh and Ramraj were placed on their own recognisance and requested to appear before a Lower Court to answer 32 charges. Singh and Ramraj as well as President of the Guyana Rice Producers Association and PPP parliamentarian, Dharamkumar Seeraj; former Permanent Secretary of the Ministry of Amerindian Affairs and PPP parliamentarian, Nigel Dharamlall; former General Manager of the Guyana Oil Company, Badrie Persaud; and Deputy Permanent Secretary of the Ministry of Agriculture, Prema Roopnarine were in May slapped with similar charges in their capacity as former directors. Unlike those to read to Singh and Ramraj on Friday, those did not include misappropriation of funds.